Landscaping in small spaces is a great way to maximize smaller and often ignored areas of your yard. From colorful and durable plantings to the creative use of flagstone or a bubbling rock, small spaces can offer a surprising flexibility in landscape design. Low maintenance shrubs are great way to add a unique look to a landscape that has smaller space. As their name suggests, these shrubs require very little of your time to keep them looking in great shape. Additionally, shrubs tend to last many seasons, which saves you the hassle of planning for them multiple times. Low maintenance shrubs come in a variety of types, from flowering shrubs to evergreens, giving you a diverse range of plants and colors to use in your yard. The specific planting you use will depend on various factors such as the amount of space available, the amount of sun light the space receives daily, and the colors that will complement the landscape, to name a few. There are shrubs that are better in the shade on one side of the spectrum, such as the Azalea (which produces pink flowers), and plants that require a lot of sun, such as the Quartz Rose Verbena (which produces clusters of small red flowers). Evergreens, plants that retain green leaves throughout the year, are a great addition to any garden. Lavender, for example, can add both color and fragrance to the landscape, while the Gold Flame Honeysuckle can add both color and privacy to a small area. The shrubs that will thrive best are those that are native to the area, as they are already adapted to the climate. A quick search on the internet should be able to tell you which plants are native to your area, and therefore best suited to flourish in your landscape. A retaining wall is a structure designed to hold or retain the soil behind it. Retaining walls are an important aspect of many yards because they prevent unwanted soil movement and sliding. They can solve drainage problems and create a more usable space for gardening. Retaining walls can be adapted to create additional seating for entertaining larger groups of people in smaller areas without the need for additional chairs, which can create clutter. You should plan on your retaining wall being around 2 feet tall to double as a seating area on a small patio project. Using different colored or sized blocks can greatly compliment the landscape, while also ensuring that the space is used in the most efficient manner possible. Flagstone is a rock that has been cut/split into flat layers that is then used for paving walkways, patios, or even roofing. Various particular stones can be used for your flagstone such as sandstone, quartzite, bluestone, limestone, basalt, and slate. These stones vary in color and texture; some are sedimentary rocks while others are volcanic in origin. Sandstone, for example, is a common rock used as flagstone; it has an earthy look comprised of soft pastels (anywhere from beige to red) with a medium texture. Bluestone on the other hand, comes in shades of blue, gray, and sometimes even purple, it is very flat but has a rough texture. One great use for flagstone in smaller spaces is to install it, then surround it with pea gravel. This type of gravel comes in various colors (pastels, earthy reds, and grays), and has a variety of uses including both landscape and decorative projects. Once the pea gravel of our choice surrounds the flagstone, you should plant a few low maintenance shrubs, and top it all off by adding a bench. This will allow you to create an inexpensive seating area in small space that looks great! Another great addition to your small landscape area is a water feature. Both a bubbling rock and a pondless waterfall are excellent choices when planning to add a water feature to a small landscape area. A bubbling rock is a decorative stone with a hole in it; this hole can be natural or drilled in. The rock is placed on a water basin, and a water pump is installed so that the water will bubble through the hole in the rock and flow over its surface. As a finishing touch, the bubbling rock is surrounded by smaller rocks, and sometimes low shrubs, ferns, or perennials. A pondless waterfall, on the other hand, is a recirculating waterfall that does not include a pond. They work by pumping the water from a reservoir up through a spillway and then back down to the reservoir. A pondless waterfall also uses a water pump and stones to create a soothing and beautiful effect. Ultimately, both choices are low maintenance options that do not take up a large amount of space, are great places for you to get creative in your landscape design, and are definitely eye catching. What ideas are you in love when it comes to landscape designs for small spaces? 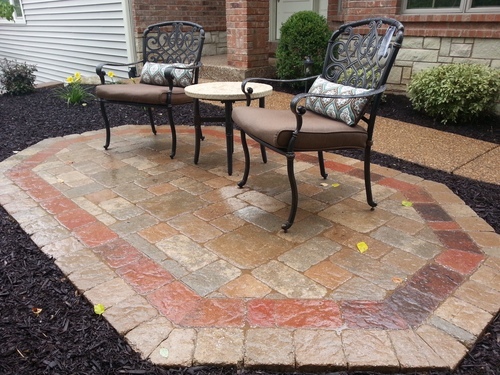 Give us a call at (636) 688-6647 to discuss your landscape design.